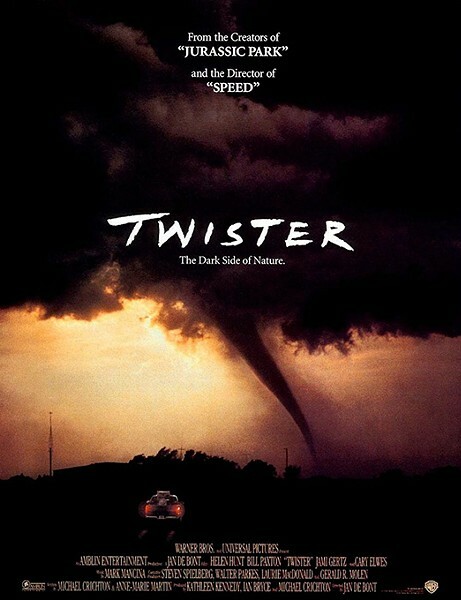 Jan de Bonts 1996 film Twister was shot on location in Oklahoma. When the trailer for Steven Spielberg’s adaptation of Ernest Cline’s Ready Player One hit theaters and YouTube this winter, Oklahoma City fans of the novel were struck by the place-name at the bottom of the screen: Columbus, Ohio. Local social media posts on the subject ran toward toxic as RP1 fans expressed extreme disappointment about the disappearance of OKC in Spielberg’s big-budget retelling. Despite that Oklahoma-based backlash, readers of Cline’s novel who understand the difficulties of maintaining continuity in film adaptations generally get it. Wade Watts has to get from OKC to Columbus at one point, and Spielberg and Cline, who adapted his novel with screenwriter Zak Penn, saw that as a difficult hurdle on screen and streamlined the action. The victim of that streamlining was OKC, and certainly RP1 readers wanted to see a local depiction of The Stacks, the girder-and-baling wire piles of trailers and vehicles where many denizens of the virtual reality world known as The Oasis live their corporeal lives. It was a tantalizing prospect; in the novel, Cline describes Watts’ area of The Stacks as near the river and Portland Avenue. For geographically savvy readers, that meant a vision of trailers south of Mathis Brothers Furniture looking out on a deserted OKC skyline. It was not the first film in the past few years to depict Oklahoma in modern or near-future dystopian times. Director James Mangold set part of 2017’s Logan in an Oklahoma City that becomes a sleazy party town with a Harrah’s casino. In 2016, Hell or High Water featured its main characters in an Oklahoma tribal casino. Depictions of Oklahoma are changing from the hardscrabble images of past films and novels to something that might be grounded in our current reality. Whether it is hip-hop, science fiction or recent literature, Oklahoma isn’t just for Westerns anymore. 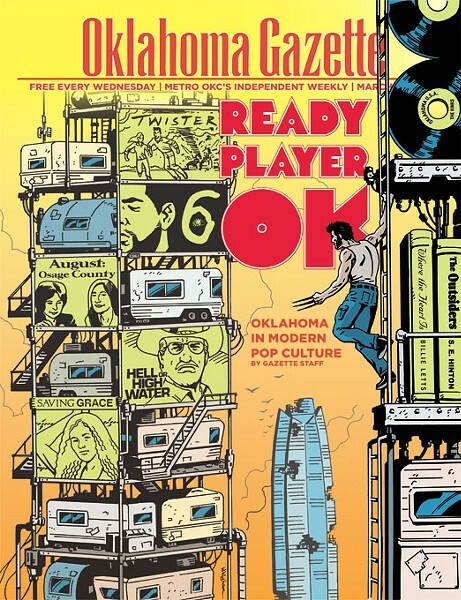 Readers’ glimpse into Oklahoma City through The Stacks of Cline’s RP1 is not exactly a glamorous snapshot of tomorrow. The dystopian near-future offers a bleak look at a world strapped of resources and shrouded in pollution, poverty and isolation. Cline was born in Ohio — the book version’s other main, real-world setting and the only non-digital location mentioned in the upcoming film — and has no strong personal connection to the Sooner State. 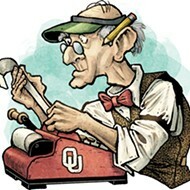 So why did the writer choose to begin his story in OKC? 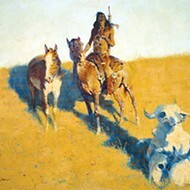 In a June 2012 interview with Tulsa World, Cline said the selection wasn’t random; he was inspired by a drive through central Oklahoma’s flat, open plains. RP1’s future outlook for the state and the rest of the world might be bleak, but Jeff Provine, founder and editor-in-chief of Okie Comics Magazine and adjunct professor of the University of Oklahoma class History of Comics, said the portrayal can actually be seen as a positive alternative to typical, rural Western scenery. Ready Player One, based on the book by Ernest Cline, hits theaters March 29. The examples above lean on the state’s established reputation as a wide-open, mostly rural state full of earnest townsfolk, but in the 2017 film Logan — the final solo film for Hugh Jackman’s X-Man Wolverine — the title character passes through a version of OKC that any local could spot as a fictitious reimagining. “It felt a bit like the screenwriters created a version of Oklahoma based on the overheard conversation of people who had recently driven through it,” said Joshua Unruh, who hosts superhero and comic-book podcasts for Pulp Diction Press. Unruh is a writer himself and said the importance of setting in a work of fiction cannot be overstated. It is no secret that Oklahoma is not the most popular setting for works of fiction, especially those consumed by global audiences. That means when the state does show up in pop culture, it can be a surreal feeling for locals. Provine can’t help but be sensitive to the way his home state is seen by outsiders. Unruh recognizes the state’s untapped potential as a diverse setting for fiction without a strong Western bent. Take the popular AMC series Breaking Bad for example; it’s a show that uses its New Mexico setting to add rich layers of beauty and realism without focusing on the state’s most overt stereotypes. As a state with a strong musical heritage, Oklahoma is not too uncommon to be mentioned in the phrasings of history’s finest songsmiths, particularly across country music. But in recent years, hip-hop has given the state some attention for things other than its rural areas and flat prairies. This is mostly thanks to the presence of the Oklahoma City Thunder, which is given major name-checks by many of today’s most popular rap stars. The Thunder’s arrival in OKC has done a lot to raise the state’s pop culture profile. On his mega successful 2016 album Views, Drake gives an extended shout out to friend and former Thunder hero Kevin Durant, rapping on “Weston Road Flows” that he can relate to the star because they get the same kind of attention. 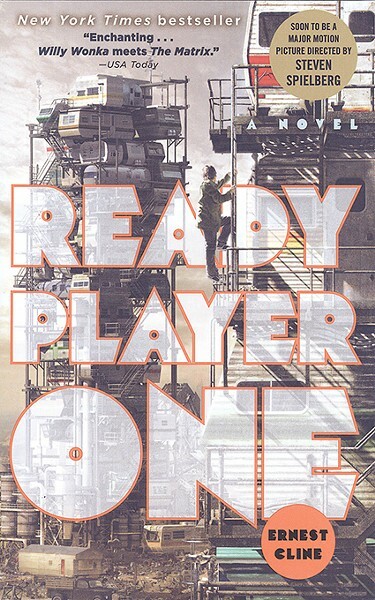 The first section of Ernest Clines 2011 best seller Ready Player One is set in Oklahoma City in 2044. Actress Meryl Streep said it best when she discussed the state with Oklahoma Film + Music Office (OF+MO) during the filming of August: Osage County. This wasn’t the first time staff from OK+MO heard big names in Hollywood or those in the film industry express delight in their experience filming in the Sooner State. With Oklahoma’s strong Western heritage, known for cowboys and Native Americans, along with its longstanding history of severe weather and destruction, the state has gained a national reputation that doesn’t paint the entire picture. While films like 1940’s The Grapes of Wrath, 1991’s My Heroes Have Always Been Cowboys and 1996’s Twister play into that reputation, more recent Oklahoma-shot films have augmented the state’s image by showcasing charming towns like Guthrie, Pawhuska and Pawnee as well as Oklahoma’s tallgrass prairies, hardwood forests and plains. Sofsky said that Oklahoma’s terrain and ecosystems, along with its vast diversity in culture, serve as the state’s greatest asset in attracting out-of-state moviemakers. The challenge lies in changing people’s perceptions and understandings about Oklahoma. 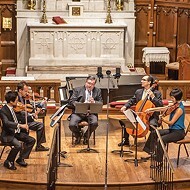 Once they learn, moviemakers are hooked, Sofsky said. It’s not uncommon for OF+MO to hear of a director or writer adding a scene or filming on a location illuminating the state’s natural beauty or the distinctive architecture that dots Route 66. OF+MO, which dates back to 1979 and is part of Oklahoma Tourism and Recreation Department, has a strong tagline for its mission: “Support, connect, promote.” Its commitment lies with both in-state and out-of-state film and music industry folks. Oklahoma City was among the best cities for moviemakers in 2018. MovieMaker magazine gave the city the No. 12 spot in their rankings of the Best Places to Live and Work as a Moviemaker. The state’s rebate program, which offers 35-37 percent on qualifying in-state transactions, is largely responsible for enticing and continuing to build the film industry, Sofsky said. Sofsky argues Oklahoma-made films are a renewable resource as movie fans watch and re-watch them, especially Christmas films during the holidays. A number of holiday films, including Christmas in the Heartland and So This is Christmas, have been filmed in Oklahoma. Last week, I Can Only Imagine hit theaters across the United States. The Christian drama is based on the story behind the MercyMe song of the same name. Major film production remained absent from Oklahoma between 1954’s Human Desire and the rise of popularity of Tulsa author S.E. Hinton among Hollywood circles. Hinton’s The Outsiders is her most famous novel, but it was her book Tex, made into a film starring Matt Dillon, that ended Oklahoma’s film drought in 1982. Director Francis Ford Coppola and Oklahoma producer Gray Frederickson arrived the next year to shoot the film adaptation of The Outsiders. The book is still required reading in school curricula across the country, and the film launched the careers of Tom Cruise, Patrick Swayze, Rob Lowe and Emilio Estevez. Coppola and Hinton combined to write and produce Rumble Fish, which was also filmed in Tulsa, shortly after The Outsiders. Coppola said the avant-garde film was going to be “what Apocalypse Now was to The Godfather” in comparison to The Outsiders, but the experimental film with homages to French New Wave hasn’t enjoyed the same staying power as The Outsiders. Frederickson, who won an Academy Award with Coppola as a producer on The Godfather Part II, still lives in Oklahoma City. He participated in a Q&A at Tower Theatre during a screening of the film in late 2017 and then went next door, where the bar Ponyboy has drink specials named after each character in the film, complete with actors’ headshots on the menu. Cruise returned to Oklahoma alongside Dustin Hoffman for 1988’s Rain Man, which won four Academy Awards, including best picture. The film showcases Oklahoma at the start of Cruise’s character’s cross-country road trip with his estranged autistic brother played by Hoffman. Both rural and urban Oklahoma is shown in the film, as it was shot at an Oklahoma City hospital and a farm in Hinton. A new generation of Oklahoma films began with 1996’s blockbuster Twister, which earned nearly $500 million, the second highest-grossing movie of the year. Director Jan de Bont elected to shoot in the small town of Wakita after driving through and seeing the remnants of damage from a 1993 hailstorm, according to a 2016 story in Tulsa World. Scenes were also shot in Pauls Valley, Ponca City, Maysville, Norman and Guthrie, but Wakita (population 344 in the 2010 census) has the strongest connection to the film. A Twister museum on Main Street includes a five-block walking tour of film sites and is filled with plenty of memorabilia, including a football brought to the set by star Bill Paxton. There is plenty of behind-the-scenes footage of Paxton throwing the football with town residents, many of whom served as extras in the movie. The town honored Paxton in 2017 following his death due to complications from surgery. Interestingly, it was Oklahoma-born country star Garth Brooks who was originally offered Paxton’s role in the movie, but he turned it down because the tornado was the real star of the movie, according to a lawsuit filed by Brooks’ former business partner Lisa Sanderson. As Oklahoma’s tax rebate on film production expenses expanded in the 2000s, more major studios have shot in the state. The rebate was useful in luring production of the 2010 adaptation of Anadarko-born author Jim Thompson’s The Killer Inside Me, starring Casey Affleck and Jessica Alba and shot in Guthrie. Bartlesville and Pawhuska served as backdrops for the 2012 drama To the Wonder and 2013 dark comedy August: Osage County, based on the play by Tracy Letts. Both films showcased modern Oklahoma as a setting for familial drama with a personal connection for To the Wonder director Terrence Malick, who grew up in Bartlesville before moving to Paris. The film spotlighting his roots is one his most critically derided projects. While not actually filmed in Oklahoma, 2016’s Hell or High Water showcased the importance of Oklahoma gaming in popular culture. Texas robbers played by Chris Pine and Ben Foster use an Oklahoma casino to launder stolen money. The next big production set to shoot in Oklahoma is the Martin Scorsese and Leonardo DiCaprio adaptation of the New York Times nonfiction bestseller Killers of the Flower Moon, which details the decades-long conspiracy to kill and cover up the murders of members of the Osage tribe after they became rich from oil. As of July 2017, the film was still in pre-production. 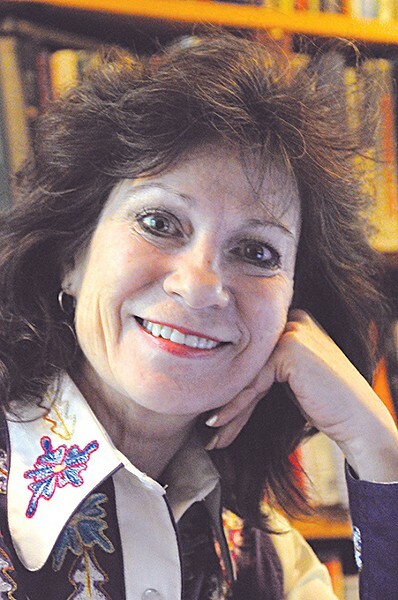 Rilla Askew author of The Mercy Seat, Fire in Beulah and 2013s Kind of Kin, said new Oklahoma voices are essential to establishing a true Oklahoma image in popular culture. Setting a film in Oklahoma requires considerable preamble involving site selection, interface with state and local governments, application for tax incentives, locating in-state crew and facilities and countless other logistical concerns. In contrast, novelists just have to know the place well enough to capture its true essence on the page. It’s a comparatively inexpensive proposition, but Oklahoma is not a place to take lightly in fiction. It is not just populated by the go-to archetype of simple country folk; it contains multitudes. Rilla Askew, author of several novels and an assistant professor at University of Oklahoma, has set all her works to date in her native state. Those include her most recent novel, 2013’s Kind of Kin, a story about immigration and intolerance in a small, southeast Oklahoma town. She said that Oklahoma is rich material for writers familiar with its culture, varied topography and diverse population, like Billie Letts, author of Where the Heart Is. For out-of-state scribes parachuting in for some barbecue and a quick visit to the Tallgrass Prairie National Preserve, or even not visiting at all, Oklahoma can be whatever it needs to be. That perception of a great, flat emptiness was exacerbated by outsider John Steinbeck’s The Grapes of Wrath and perhaps given more dimension by Thompson’s hard-boiled noir fiction. The cure for such one-dimensional depictions of Oklahoma could come from something as simple as the establishing shots of the Oklahoma City skyline during coverage of Thunder games, nationally broadcast proof of the state’s progress beyond sod houses. But Askew said the most lasting change could come from homegrown talent, artists who can shift the narrative toward Oklahoma’s modernity and away from both its real and imagined past. “The more voices that come out of this place in terms of literary voices, filmmakers, poets, that’s going to be less true as time goes on,” she said. Print headline: Pop OK; Portrayals of Oklahoma in popular culture — movies, TV shows, books and music — have improved over the past couple decades.